This fluted bowl is from the End Of Day® series, meaning it is made with a variety of colors used throughout the day, contains nearly every color in the rainbow, and even has real gold adventurine added for that extra gold sparkle. 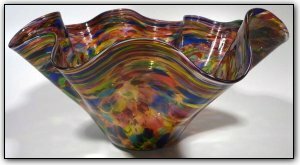 The inside has a slightly different tone of colors than the outside, and this is done by putting a thin layer of white between the layers of color which really makes the colors just about jump out of the glass. And one of the neatest aspects of this piece is that the more light you shine on it... the more it sparkles!